A precision instrument approach to touchdown and, in some cases, through the landing rollout performed by the aircraft autopilot. The autopilot receives position information and/or steering commands from onboard navigation equipment and is not dependent on any ground-based aids. Autoland approaches (and coupled approaches) are flown both in VFR (very high frequency) and IFR (instrument flight rules). 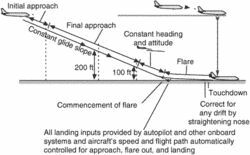 These approaches are usually carried out when the weather conditions are less than approximately 4000 RVR (runway visual range), provided the crews are certified for autoland approaches.